Xenon FF-Primes – a set of matched professional primes, purpose-built from scratch for the demands of today’s high-resolution digital cinematography – made to last through generations of changing camera technology. In today’s fast moving world the last thing you want to slow you down is your optics package. That’s why Xenon FF-Primes were custom designed from the ground up to be versatile enough to work with an array of cameras and accessories you may need for various projects today and tomorrow. So whether it is RED Dragon or Weapon, Canon C100/C300/C500, Arri Alexa, Black Magic, Sony F5/F55 and HDSLR cameras, these compact lenses provide 4K (4096 × 2304 pixels) resolution and cover the full 43.3 mm image circle usable on Canon 5D and Sony A7 cameras. 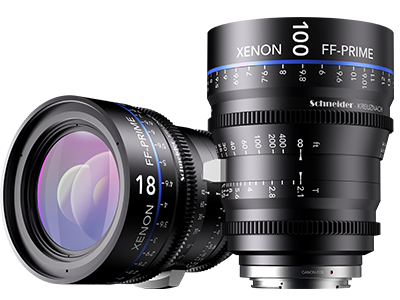 The Xenon FF-Prime family currently includes 18 mm T2.4, 25 mm T2.1, 35 mm T2.1, 50 mm T2.1, 75 mm T2.1 and 100 mm T2.1 focal lengths. These German-made optics offer outstanding image quality yet are ruggedly built to withstand the daily rigors of a working set. They are purpose built for today’s full frame sensor cameras to meet users’ exceptionally high demands in terms of optical performance and ease of use. Each compact lens offers an all new optical and mechanical design for outstanding operation and performance as well as rugged reliability. The circular 14-blade aperture is specially engineered for a smooth and consistent bokeh. The precision constant volume focusing design ensures that breathing is minimized. And with a 300-degree barrel rotation, the manual focus markings offer accuracy and repeatability. Additionally all lenses are color-matched for consistency. Engineered for compatibility with industry standard cine-style accessories like follow focus rigs and matte boxes, the Xenon FF-Primes feature identical external dimensions and positioning of focus and gear rings in each focal length. Operators appreciate using the oversized focus and distance scales that are readable on both sides of the lens. To accommodate filters and other accessories, each lens has a 100 mm front diameter and a standard 95 mm thread. "Litepanels Gemini 1x1 Promo Video"